We will notify you when this model becomes available. NOTE: All Hermes Handbags are Final Sale due to the sensitivity of the leather and handling. Also, all (Chanel and other) items which state "NWT" (new with tags) or "New" in the title, store-fresh, are Final Sale as they have never been handled by any individual other than the photographer. We do not mark like-new items which come in on consignment from a previous owner as "new" but as "pristine"; all items that are marked "new" have never been handled by any other customer. If you are not satisfied with your purchase for any reason, you may return your item for a refund within three (3) calendar days of receipt of your item (does not have to reach us in 3 days, but must be dropped off/tracking provided within 3 days). The item must be the same condition in which it was received by you and our tamper-proof yellow security tag must still be on the bag and untampered. Please provide tracking information for your return shipment for us to note it has been shipped back within three days of receipt. We will process your refund within two business days of receipt of the returned package - we require this time to open the package and verify its contents. You can return your package to the California address on the return instructions page in your package. For any and all issues where you are returning an item due to authenticity (which has never happened and will never happen in our boutique), we will double your money back. See "Authenticity" above for more info. There is NO DEADLINE or expiration for this policy - you do not have to get your bag authenticated within 3 days or lose the chance to return something due to authenticity-related issues. Selling a fake is a federal crime, and every consumer who purchases a counterfeit should be aware that they are entitled to not only get their money back from any fraudulent seller, but should also request the seller be prosecuted by the federal government to the fullest extent of the law. 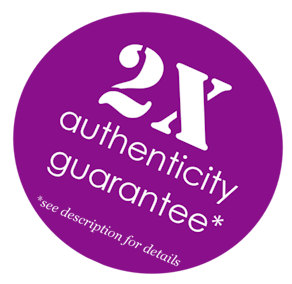 Please see our double-your-money-back guarantee on authenticity. We usually ship within the next business day upon receipt of cleared payment. Shipping to the United States, major territories, and APO addresses, is $25. We ship FedEx Ground or FedEx Express Saver, depending on your location, so that you will receive the item no later than three days from when it was shipped. A signature is required for you to receive your package. We also ship to other countries, including the United Kingdom, Canada, Australia, Europe, Singapore, Hong Kong, Japan, South Korea, Indonesia, Taiwan, Malaysia and other areas. International shipping is USD $65 for FedEx International and is usually guaranteed to arrive within 3 to 5 business days to your local city of residence. * A signature is required for you to receive your package. For international buyers - Customs may impose fees and/or taxes on your purchase prior to delivery. To find out more about potential customs fees, please contact your local customs office. You as a buyer are responsible for any and all customs fees and taxes if they should occur. This is not included in the shipping fee. *For international buyers outside the U.S. - the estimated delivery time is to your city of residence. You may or may not experience additional delays due to local customs inspecton, should your package be held. These times can vary, or not happen at all, it is up to your local city's procedures. - All of our items come with a double-your-money-back guarantee on authenticity. That means that we guarantee the authenticity of this item to the point where if you ever were to find it not authentic, we would refund twice the amount of your initial purchase price. - Recently, we also started offering complimentary third party authentication vouchers along with each Chanel purchase, and these voucher codes can be redeemed with Etinceler Authentications, the go-to authentication house for federal cases, investigations, Ebay and PayPal claims, on Chanel. We started doing this to give our customers extra peace of mind, since each piece we sell is pre-owned. To learn more about our new complimentary authentications voucher redemption, you can click here. Thank you for your interest. An agent will get back to you shortly. A must-have for any Chanel gal, this item, also referred to as the classic reissue 2.55, is a wardrobe staple with its signature Chanel quilted material and Brushed Gold hardware. This special edition quilted classic reissue flap from Chanel is featured in a soft jersey-like crocodile-quilted canvas, which makes the bag lightweight and perfect for year-round. The Brushed Gold bijoux chain adds more sparkle against the Pink quilted canvas. Inside "flap" front has a mirror. This item is in very good condition with very few signs of normal use. Exterior bottom shows some slight darkening but barely visible. Hardware shows slight signs of lightening on some parts of the bijoux chain, but not visible at arm's length. Interior is clean. Corners are clean with no signs of rubbing or scuffing. Please see photos for details.